Before we continue down the Rideau Canal, a little history and background is in order. We Americans can take some credit for the Rideau Canal. Our agressive actions during the War of 1812 inspired the British to build the canal as a safe and defensible route for transporting military supplies and troops between Lake Ontario and Ottawa. As we understand it from the history presented here, while the British were busy fending off French aggression in 1812, the Americans figured they could sneak up to Canada and snitch some land when the British weren't looking. It was only the American troops' disorganization that kept them from effectively blockading the St. Lawrence River. The Rideau Canal was a military project, led by Lieutenant Colonel John By of the Royal Engineeers, who began leading its construction in 1826. The canal was 121 miles long, cut through rocks and swamp and rough wilderness to make the Rideau River navigable and connect it with other waterways to reach Lake Ontario. Because the canal was a military effort, By built block houses, little fortresses, at strategic points along the route to defend it from attack. It took thousands of laborers six years to complete the job, one of the greatest engineering feats of the 19th century. Colonel By overcame obstacles others thought insurmountable. He managed to maintain construction in the face of malaria outbreaks each summer that killed hundreds of workers, and high fatality rates among the often inexperienced workers responsible for using powder to blast rocks. Over and over again, he found the work of his surveyors was faulty, and he had to change plans along the way, often coming up with ingenious solutions that reduced the amount of labor required. When the canal was finished, he was called back to Britain, where he probably expected to be thanked and honored for his fine work. Instead, he was accused of misappropriating funds. He kept meticulous records, and the charges were eventually dropped, but by then he was a disillusioned and broken man. If only he could come back now and see all the statues, plaques, and monuments praising him and his work, and the beautiful lake and island named for him. As a credit to John By and the thousands of Irish immigrants, Scottish stone masons, and French Canadians who worked on the locks, most of the locks we passed through are just as they built them back in 1832. The wooden doors are replaced regularly, but the stonework of the lock chambers and the dams is intact, and the block houses stand firm. The lock tenders operate them just as they were operated 173 years ago. The Rideau Canal begins in Canada's capital, Ottawa, and ends in the lively metropolitan center of Kingston on Lake Ontario. Inbetween it traverses narrow canals, winding rivers, wetlands and lakes. The scenery is rural -- farmlands, rocky and wooded shores, lakes lined with vacation cottages and dotted with rocky islands, a few tiny towns built around long-abandoned mills. Every day of our passage down the Rideau was sunny, with temperatures 85 degrees or more. We went through a lot of sunscreen, and looked forward to opportunities to jump in for a swim. The controlling depth of the canal is five feet, and in most places the bottom is rocky. The draft of our boat is four and a half feet. So we did have some heart palpitating moments of skinny water, but we never touched bottom (at least not that we noticed). Our biggest challenge was keeping our running gear clear of weeds, which grow like forests in some areas of the canal. Weed-cutting boats do operate somewhere along the canal, but they just were never in ervidence anywhere we were. Actually, our biggest challenge was combatting deer flies, with mosquitos running a close second, but that's another story entirely. This page is getting pretty long already, so I will go to another page to clip through the highlights of our trip down the Rideau. Click below to take the Express Tour -- including a Dutch Festival, a trip to a chocolate factory, a swim in the locks, and more. 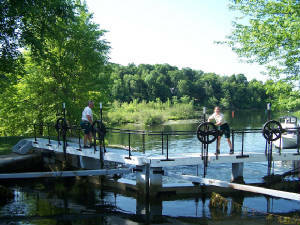 After you read about the lock tenders (below), click here for Rideau Canal Highlights -- the Express Tour. The fulltime lock tenders work six days a week, eleven hours a day during the season, and "bank" their hours over 40 per week so that they can keep getting paychecks in the winter, when their hours are limited to a few weeks of lock maintenance work. We thought this seemed like a pretty tough summer work schedule, until we learned that the original lock builders labored 16 hours per day six days a week all year long doing back-breaking work like cutting and hauling stone. The many college kids who have summer jobs working the locks work three eleven hour days per week. They compete for the job by taking an oral exam on lock operation and Rideau history. Once you get the job, you pretty much have it every summer you want to come back while you are still in school.